Tired of the same old recipes for dinner? 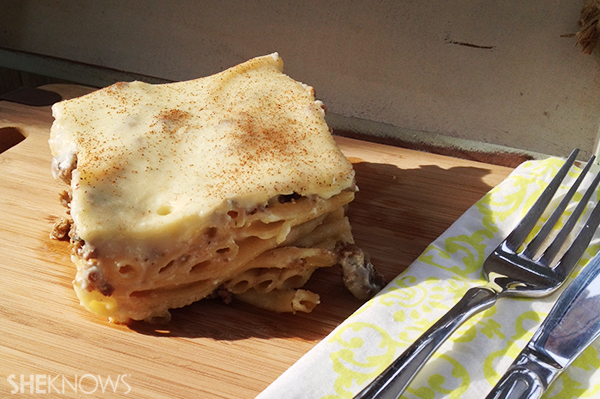 Switch things up with this Greek version of lasagna. Forgo the tomatoes for this one — béchamel sauce goes a long way in this meaty casserole. Traditionally the Greek version blends a bit of tomato sauce into the ground meat mixture. But for this recipe, we’re going the Cypriot route and omitting the tomato. In a large pot, pour the chicken stock, and add enough water to boil the pasta. Cook the pasta until al dente. Drain, but keep the water-chicken stock mixture, and set it aside. Mix together the pasta, 2/3 cup of olive oil and half a cup of grated cheese. Spread in a smooth layer into a casserole dish. In a pot or Dutch oven on medium heat, add the remaining 2 tablespoons of olive oil. Sauté the onions until translucent (about 2 minutes), then add the parsley, ground meat and salt and pepper to taste. Brown the meat thoroughly, then turn off the heat. Spread a layer of the meat mixture on top of the pasta. In a separate pot on medium to high heat, add the butter. Once melted, add the flour, and whisk for a couple of minutes. Next, stir in the milk and egg. Pour in 2 cups of the chicken stock, and whisk the sauce until it begins to boil. Lower the heat, add half a cup of cheese, and continue to whisk until the béchamel is thick and creamy. If needed, add more flour to thicken it. When the sauce is thick enough that it sticks to your whisk, remove it from heat, and pour it over the meat in the casserole dish in a smooth layer. Garnish with cinnamon, and place in the oven for 45 minutes.